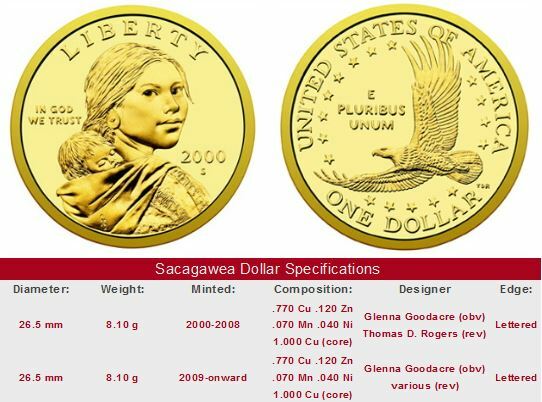 The Sacagawea Dollar coin was created through the United States $1 Coin Act of 1997. The major purpose of the Act was to replace the Susan B. Anthony Dollar. Even though the Anthony Dollar never gained wide circulation, increased use of the coin by mass transit systems and vending machines led to its projected stockpile depletion. Faced with the prospect of minting additional quantities of an unpopular coin to meet the demand, Congress authorized the U.S. Mint to develop a new dollar coin with a gold color and distinctive edge, to make it easy to identify. On May 19, 1998, the Treasury department formed the Dollar Coin Design Advisory Committee (DCDAC) to select a design for the new dollar coin. Three weeks later, the DCDAC recommended that the new dollar coin bear a design of Liberty represented by Sacagawea, the Native American woman who assisted Lewis and Clark on their exploration of the American West in 1804-1806. On May 4, 1999, the Mint unveiled the selected design for the Sacagawea Dollar coin at a White House ceremony. Artist Glenna Goodacre portrayed Sacagawea in three-quarter profile. On her back, she carried her infant son Jean Baptiste. Six months pregnant when she joined the expedition, Sacagawea gave birth to Jean Baptiste early in the journey. Thomas D. Rogers designed the reverse, featuring a soaring eagle encircled by 17 stars, representing the number of states at the time Lewis and Clark began their westward odyssey. The Sacagawea coin was released to the public in January, 2000. The selection of the Sacagawea Dollar coin was not without controversy. Some questioned the Treasury's predicted popularity of the design. The General Accounting Office (GAO) conducted a telephone survey in late 1998 to gauge the public’s preference for either Sacagawea or the Statue of Liberty as the image on the new dollar coin. The GAO reported that 65 percent of the survey respondents preferred the Statue of Liberty, and 27 percent preferred Sacagawea. Another 2 percent said either choice was acceptable, about 3 percent said neither was acceptable, and 3 percent said they had no opinion. The Treasury Department dismissed the findings of the GAO over concern that the survey was too narrow; only Americans with telephones were contacted and all questions were asked in the English language. Furthermore, Treasury defended their own outreach effort, saying it sufficiently captured the public's views on the Sacagawea coin, but provided no statistical evidence to show their results were applicable to the adult population of the U.S. mainland. 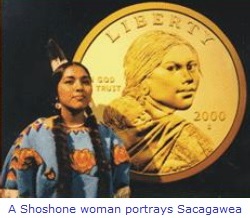 There is no known cotemporary portrait of Sacagawea, so artist Glenna Goodacre asked Randy'L He-dow Teton of the Shoshone tribe to model for the Sacagawea Dollar coin, first issued in 2000. Ms. Teton toured the country extensively to promote the introduction of the new golden dollar and as a motivational speaker to encourage Native American education. Image courtesy of US Mint. Despite a $53 million promotional campaign by the federal government, the Sacagawea Dollar coin failed to catch on with the general population. Mintage fell from 1.286 billion in the year 2000 to 7.6 million by 2002. The major culprit cited for the failure of the dollar coin is the continued presence of the $1 paper bill. If the experience of other nations that have successfully introduced a high-value coin means anything, then the dollar note must be removed from circulation for the dollar coin to have a chance. In 2009, the Sacagawea Dollar began carrying a new reverse, in accordance with the Native American $1 Coin Act. The reverse design will change each year to commemorate contributions made by Indian tribes and individual Native Americans to the United States. The coins will be issued in somewhat chronological order of the events or lives of the persons depicted on the reverse. After the last of the presidential dollar coins are issued, expected sometime just before the year 2020, the Native American $1 Coin Program will continue, although reverse designs will be selected without regard to chronological order. There are no Sacagawea coin key dates. However, a die variety discovered in 2005 for the 2000-P has collectors searching through one Sacagawea Dollar coin roll after another. As part of the initial public awareness blitz, the Mint partnered with General Mills to insert 5500 of the new coins in randomly selected boxes of Cheerios cereal in late 1999, giving the food giant enough time to get them onto store shelves by early January. Sometime after the 5500 Sacagawea Dollars were sent to General Mills, but before more coins for circulation were struck, the Mint altered the reverse die to correct a manufacturing issue. In doing so, the amount of detail on the eagle's tail feathers was slightly reduced. Thus, Sacagawea Dollars sent to the Federal Reserve for widespread distribution in late January and beyond all were of the second die variety. Of all the Sacagawea Dollar coins minted in 2000, only 5500 of them, or 0.00043% of the overall total, were produced by the first die variety, and all of them found their way into private hands through Cheerios boxes. As of 2014, only a few sales of the "Cheerios Dollars" have been recorded, but the selling price per coin has reached as high as $11,500. According to some of the leading grading services, they've seen only a few dozen of the Cheerios Dollars, so far. Whether or not these high prices hold firm in the future is anyone's guess, but one thing is certain: Collectors seeking a Cheerios Dollar example have an extraordinarily tiny supply from which to select. Other than the Cheerios Dollar, there hasn't been a great deal of numismatic interest focused on the Sacagawea Dollar. This is not surprising, considering that it is a fairly new coin available in huge quantities. Still, judging by some of the selling prices of ultra-high grade examples in MS-68 or better, its clear that out of a enormous universe of Sacagawea Dollar coins, not that many of them have been preserved in a near perfection state. So, if you want to make this coin series your specialty while hoping someday other collectors will pay a lot more for what you're buying today, your best hope is to concentrate on coins graded MS-68 or higher. Be careful, because there are lots of "alphabet soup" grading companies out there slapping "MS-70" labels on every other Sacagawea Dollar. Don't fall for it. You may have to spend a little extra for coins graded by the services of PCGS, NGC, ICG, or ANACS, but in return, you'll get the coins other collectors will pay the most attention to.